Regulation is the adjustment of the Action, which is the assembly of mechanical parts from the keys to the hammers that strike the strings to achieve a uniform and responsive touch. Proper regulation will increase dynamic range thereby allowing the very softest to loudest passages to be played with the most expression possible. 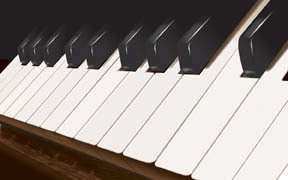 As a piano is played and ages, the action parts, which are typically made of wood and felt, change dimension from wear and compression over time. These changes effect the proper regulation and ultimately the touch of the action. Action centers and key guide pins, which are made of steel, can corrode and cause undue friction and sluggishness resulting in poor repetition and uneven response. Like tuning, action regulation should be performed on a regular basis for the best possible response. But unlike tuning, a complete regulation is typically required less often. With regular tuning and service, I can determine when your piano is in need of a regulation and we can make arrangements specific to you and your piano's needs.